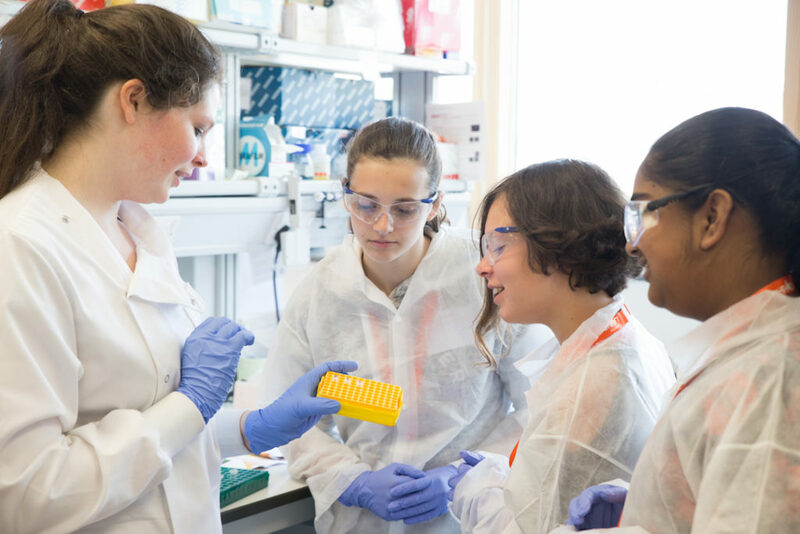 Year 8 students from around Cambridgeshire were invited to apply to take part in an Innovators-level Cambridge LaunchPad event with the Babraham Institute. For their application they were tasked to extract DNA from soft fruit, using a standard process that has been used in classrooms for over 10 years. The teams from Swavesey Village College and Netherhall School that most impressed the judges with their project posters were then invited to attend a hands-on activity day at the world-leading Babraham Institute. The project day was designed and delivered by PhD students currently working at the Babraham Institute, giving the winning teams a fantastic opportunity to work in the laboratories and to learn the importance of STEM beyond the classroom. They tasked the students with routine lab procedures; polymerase chain reaction (PCR), used to amplify DNA, and agarose gel electrophoresis, used to separate DNA molecules based on size. Using these techniques, the students were able to determine whether the DNA samples contained mutations of a particular gene. Cambridge LaunchPad is a movement led by Cambridge science, technology and engineering companies, investing their talent and resources to inspire young people into STEM careers and is managed by Form the Future CIC. This programme was developed to inspire a love and fascination of engineering, science and technology in young people and help to educate them about the exciting opportunities that exist in the STEM sector. Specifically, it was designed to address the significant gender and skills gaps which exist in STEM employment. During the academic year, each of the industry partners host a project day, giving the students a chance to gain hands-on experience within the industry. Project days like this one at the Babraham Institute give companies an opportunity for their employees to expand on skills such as project management, communication and leadership, as well as increasing the impact of their community outreach goals. In this case, early career employees were able to engage with the next generation of potential STEM professionals, giving them an insight into the career pathway options available to them – whether through university, apprenticeships or work experience placements. If you are looking for ways to increase your STEM outreach potential and build your employees’ transferable skills, get in touch with us. We can help you to inspire young people to get enthused about the world of STEM! Contact Molly Askham at cambridge-launchpad@formthefuture.org.uk or on 01223 781296.